some of the world’s lowest-carbon fossil-free fuel. to open right here in Jamestown’s back yard. Earth. See the future at www.newenergyblue.com. 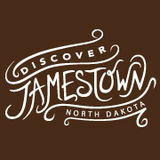 n behalf of the City Council, the City Administrator and City Staff, welcome to Jamestown, North Dakota. As you browse through this publication, should you have any questions about this beautiful city we call home please feel free to contact me. Jamestown is home to 16,000 friendly people, great public and private schools including the University of Jamestown. We are also well connected by non-stop jet airline service to Denver. Hundreds of years before the arrival of European settlers the people who lived in this prairie region referred to the valley at the confluence of the James and Pipestem rivers we know as Jamestown as the “Gathering Place.” We invite you to gather in Jamestown for a visit or for a lifetime. About this Publication This guide was published and produced in collaboration between The Jamestown Sun and Jamestown Tourism. Photos throughout the guide were provided by Jamestown Tourism, The Jamestown Sun, John M Steiner, and Searle Swedlund. etween the communities of Jamestown and Carrington lies the Prairie and Pothole Region. Volunteers from Birding Drives Dakota and the Friends of the Arrowwood National Wildlife Refuge have made it easy to go where the birds are. Six birding drives will take you to remote hotspots amid sweeping grasslands, rolling woodlands, wooded draws and diverse marshlands. Chase Lake and Arrowwood National Wildlife Refuges provides 75,000 acres of venue for birding. Chase Lake is home to one of the largest American White Pelican mating colonies in North America. The Arrowwood Refuge Headquarters provides a number of visitor services including a visitor center, a 5 ½ mile auto tour, view blinds for the dancing of the sharp-tailed grouse in early May, as well as several nature and hiking trails. For more information, call 701 285-3341 or go to www.fws.gov/ refuge/Arrowwood. Open Monday through Friday, 7:30am to 4pm. C A M P IN G Forgot your tent stakes? Weâ&#x20AC;&#x2122;ve got those. Wish the weather would cooperate? Visit one of the 13 historic sites and museums nearby. Is the heat getting you down? No need to abandon your vacation, camp in at one of the many hotels and let the kiddos splash around in the pool. You can get away without leaving the conveniences. Jamestown has over 250 campsites within minutes of the heart of downtown. Discover over 31 miles of terrain on one of the 5 signature trails in Jamestown. Developed by volunteers of the Jamestown Area Mountain Bikers and Jamestown Parks & Recreation, these trails provide varying degrees of difficulty. The heart of the course contains heart pumping climbs with challenging kick turns and jumps along the route. Be prepared for a fun and exhilarating experience. This entry level trail is perfect for the family to enjoy time together. The trail stretches 5 miles in one direction providing peaceful views of the natural beauty of Pipestem Lake. Continue from the Split Rock Trail onto the Overlook. This 5 mile looped stretch provides a workout as the trails climb up and down the scenic bluffs overlooking the Reservoir. Named after our beloved white buffalo, the White Cloud trail begins at McElroy Park. After climbing out of the wooded river bottom, the trail continues onto the open and vast North Dakota prairie. Below the paved walking path along the east side of the Jamestown Reservoir youâ&#x20AC;&#x2122;ll find this hidden trail. Great for an early morning run or an evening hike with the family. Jamestown D owntown A ssoc i ati on 5 th A nnu al R od s and H og s Saturday, June 8 - Downtown Jamestown Noon-8 p.m. Jamestownâ&#x20AC;&#x2122;s downtown festival featuring classic cars, street bikes and anything else that goes VROOM. Food, games and street dance to follow. It just Makes Sense! Jamestown Regional Airport offers non-stop commercial airline service to Denver, connecting you with ease to other flights around the world. Jamestown Airport offers quality service, quick check-ins, short security lines, wireless internet, FREE PARKING. Professional to Personal. Elegant to Intimate. Corporate to Festive. Any gathering can be ideally accommodated. It’s Your Big Day! Contact us for your Wedding or Wedding Reception. We are flexible. Bring your own food or hire a caterer. 115 2nd St SW 701-251-2496 â&#x20AC;&#x201C; www.jamestownarts.com Hours: Monday-Friday, 9 a.m. to 5 p.m. Saturday 10 a.m. to 2 p.m. Admission: Free Located in the heart of historical downtown Jamestown, The Arts Center hosts a rotating fine arts exhibit all year round featuring regional artists. Concerts are held featuring music of all genres throughout the year. 115 2nd St SW Featuring public arts by renowned artists, the Hansen Arts Park is a great place to find inspiration and relax. Every Thursday June through August, the Arts Market hosts a street fair complete with live entertainment, arts & crafters, food and more. The gallery at The Arts Center features a fine art exhibition that changes every 4 – 6 weeks. The gallery is open all year round Monday – Friday from 9:00 am – 5:00 pm, and Saturdays from 10:00 am – 2:00 pm. Admission is always free and open to the public. The local band of photo enthusiasts will be meeting the third Tuesday of each month at 6:30 pm in the Hansen Arts Studio. Topics are focused primarily for DSLR camera users. Our local group of wood carving aficionados meet the third Thursday of the month (except for Holiday weeks) from 6:30 – 8:30 pm at the Hansen Arts Studio. They love to share their knowledge. Any skill and interest level is welcome to participate. They may even be willing to lend you a chisel. Poets, writers, musicians, comedians, solos, duos—all performers are welcome to share your talent with the community at our monthly open mic night. Limit your piece to 10 minutes. P.A. system, bass amp, guitar amp and music stands are provided. Facilitated by musician Steve Kuykendall. Watch for more information on The Arts Center’s Downtown Arts Market... Live music, artisan vendors, arts, crafts, and more. Join us every Thursday from June through August 5:00 – 9:00 pm in the Hansen Arts Park downtown Jamestown. R od s, H og s & T h i ng s th at g oV R O O M ! The Jamestown Talking Trail is a self guided, audio tour that allows you to hear the history of Jamestown. Immerse yourself in the stories of history and folklore. With over 70 talking trail stops around the community including the Frontier Village, the National Buffalo Museum, St James Basilica and more. Get started by dialing 701 712-9329, the press the stop number followed by the # key. ALL JAMESTOWN EVENTS. ONE PLACE. St. John’s Academy is a Catholic elementary school that provides a loving environment where students can develop intellectually, socially, emotionally & spiritually. No Job Too Big or Too Small! GIVE US A CALL! FROM FUEL TO FOODS, WE’VE GOT YOU COVERED! 116 1st St. E 701-252-8994 Full service menu, open to all. 611 25th St. SW 701-952-7753 Full service menu. 1801 8th Ave. SW 701-252-2048 Sandwiches, salads, drive-thru, dine-in, take-out. 100 1st Ave. S 701-251-2227 Coffee drinks, sandwiches, soups, baked goods. 2314 Highway 281 S 701-251-1217 Sandwiches, burgers, salads, drive-thru, dine-in. Inside Hugos at 310 1st Ave. S 701-252-0981 Coffee drinks, baked goods, and sandwiches. 509 10th St. SE 701-252-2500 Chinese food buffet and menu. 330 Business Loop W 701-252-4181 Sandwiches, burgers, salads, ice cream, drive-thru, dine-in. Jamestown Business Center 302 2nd St. NE 701-252-1003 Burgers, sandwiches, soups, breakfast all day. 706 1st Ave. S 701-252-8888 Pizza, sandwiches, pasta, chicken wings, dine-in, carry-out, delivery. 324 2nd Ave. SW 701-252-3642 Bar and grill menu, everyone welcome. F r onti er F or t B ar & G r ill 1838 3rd Ave. SE 701-252-7492 Bar and grill menu. 901 1st Ave. S 701-252-3176 Full menu, dine-in, carry-out, drive-thru. 605 25th St. SW 701-251-2888 Chinese and American buffet. H u l a’ s F i r e G r i l l 110 2nd St. NW 701-952-3700 Dine In, Delivery. Food from Hawaii. 1009 13th St. NE 701-952-5550 Burgers, homemade pizza, wings. Jonny B ’ s B r i c k h ou se 215 1st Ave. South 701-952-8777 Woodfire pizza, wings and more! K ni g h ts of C ol u mb u s 519 1st Ave. S 701-252-6069 Full menu, open to all. 2619 8th Ave. SW 701-252-1930 Full Mexican menu. 810 20th St. SW 701-252-9538 Breakfast, burgers, sandwiches, dine-in, drive-thru. 410 10th St. SE 701-952-1256 Breakfast, sandwiches, home cooking. 113 Business Loop W 701-368-3800 Coffee drinks, baked goods. 921 13th St. NE 701-251-1585 Chicken, burgers, sandwiches, ice cream, drive-thru. 725 1st Ave. S 701-252-8282 Take and bake pizza, salads. P ar ad i so M ex i c an R estau r ant 413 24th St. SW 701-252-7777 Mexican cuisine. Junction I-94 and U.S. Hwy 281 S 701-252-1370 Full menu, bakery. 805 20th St. SW 701-952-2000 Pizza, crispy bread, chicken, buffet, dine-in, carry-out, delivery. 721 1st Ave. S 701-251-9348 Subs, sandwiches, wraps, salads, dine-in, carry-out, delivery. 2612 8th Ave. SW 701-253-9700 Full menu, burgers, bar and grill. S & R T r u c k P l az a C af é 1609 Business Loop E 701-252-4911 Full menu, breakfast served all day. 103 1st Ave. S 701-952-9529 Steak and fish specialties. S h ad y ’ s R estau r ant & L ou ng e Gladstone Inn & Suites 111 2nd St. NE 701-252-0700 Breakfast, lunch buffet and dinner. (2 locations) 907 7th Ave. SE 701-252-8249 1921 8th Ave. SW 701-252-4167 Subs, sandwiches, salads. 105 Business Loop W 701-251-9488 Mexican food, salads, drive-thru. 718 10th St. SE 701-252-2508 Mexican food, drive-thru. T ap p ’ s L ou ng e Quality Inn 507 25th St. SW 701-252-3611 Bar and grill menu. Celebrating our 60th year of serving the community! E A C H O F F IC E ISIN D E P E N D E N T L Y O W N E D A N D O P E R A T E D .
Two Rivers Activity Center is a state-of-the-art recreation center that includes an indoor pool, gymnasium, turf and bubble space as well as a strength and cardio area and walking track. We offer day and week long passes for the facility as well as monthly memberships. We have basketballs, volleyballs, tennis and soccer equipment available for use. Just remember a clean pair of tennis shoes and your own towel for the pool! Visit our website for more information and hours of operation. If you are looking for something to do while visiting Jamestown youâ&#x20AC;&#x2122;ve come to the right place! We have several parks that include everything from disc golf to baseball diamonds to kids play structures. Check us out online or give us a call for more information on local activities. L I K E N OW H E R E E LS E Here we take care of each other. We know life with kids is fun - and busy. That’s why convenience is important. We can help. Schedule a primary care appointment online anytime at EssentiaHealth.org or call 701.253.5300 for an appointment. G E O C A C H IN G A high tech outdoor game that uses a GPS Receiver or GPS enabled smartphone app to find containers (geocaches) hidden by other players. Geocaches can range in size from the size of your thumb to a 5 gallon pail. Many contain trade items with the expectation that you leave something of equal value. All geocaches contain a log sheet for the player to sign to verify their visit to the cache. Within 30 miles of Jamestown there are approximately 170 caches. An introductory guide to geocaching can be found at www.geocaching.com/guide. Jamestown/ S tu tsman D ev el op ment C or p .
120 2nd St. SE 701-252-4830 www.jamestownchamber.com Monday-Friday 7:30 a.m.-4:30 p.m.
1002 2nd Ave. SE 701-252-3982 www.jamestownparksandrec.com Monday-Friday 7:30 a.m.-4:30 p.m.
120 2nd St. SE 701-252-6861 www.growingjamestown.com Monday-Friday 9:00 a.m.- 5:00 p.m.
429 2nd St. SW 701-952-8060 www.scdrc.org Monday-Friday 8:00 a.m.-5:00 p.m.
www.jamesriverlibrary.org Alfred Dickey Branch 105 3rd St. SE 701-252-2990 Monday-Thursday 10:00 a.m.-8:00 p.m. Friday 10:00 a.m.-6:00 p.m. Saturday 11:00 a.m.-4:00 p.m. Stutsman County Branch 910 5th St. SE 701-252-1531 Monday-Friday 9:00 a.m.- 5:00 p.m.
429 2nd St. SW 701-253-6200 www.jobsnd.com Monday-Friday 8:00 a.m.- 5:00 p.m.
300 2nd Ave. NE #139 701-252-5596 Monday, Tuesday, Thursday and Friday 8:00 a.m.-4:45 p.m.
120 2nd St. SE 701-952-0852 Monday-Friday 7:30 a.m.-12:00 p.m. and 1:00 p.m.-4:30 p.m.
212 2nd St. SW 1-800-275-8777 Monday-Friday 8:00 a.m.- 5:00 p.m. Saturday 10:00 a.m.- 1:00 p.m.
S ani tati on D ep ar tment 3020 18th St. SE 701-252-5223 Bailing Facility Hours: Monday-Friday 8:00 a.m.-3:30 p.m. Saturday 8:00 a.m.-11:30 a.m.
2422 20th St. SW 701-952-1050 www.jrmcnd.com This 25 bed, state-of-the-art medical facility opened in July 2011 and provides a 24-hour emergency department, family birth place, intensive care and surgical services along with a full line of medical services. 2605 Circle Dr. 701-253-3650 The hospital specializes in psychiatric and substance abuse services for individuals whose needs exceed the resources and capacity of other community facilities. 122 2nd St. NW 701-252-8130 www.centralvalleyhealth.org Services include nursing services as well as emergency services, environmental health, immunizations and screenings. 2430 20th St. SW 701-952-4878 JRMC clinical services include on-staff specialists in podiatry, orthopedics and obstetrics. The hospital clinic also hosts visiting specialists in a variety of fields. 2430 20th St. SW 701-253-5300 1-800-247-0159 The clinic offers a full range of services including family medicine, diabetic medicine, podiatry and general surgery. The clinic hosts visiting specialists from within the Essentia network. Second Avenue Clinic 300 2nd Ave. NE 701-251-6000 1-800-543-4321 Fifth Avenue Clinic 904 5th Ave. NE 701-253-4000 These clinics are part of the largest, rural, not-for-profit health care system in the nation. The offer a full range of services including family medicine, psychology, surgery, physical therapy, cardiology and more. 2422 20th St. SW 701-952-4787 A community-based outreach clinic of the Veterans Affairs Hospital in Fargo. The clinic offers basic services with referral to the Fargo clinic and hospital for specialty cases. 501 19th St. NE 701-252-5660 www.avemariavillage.org This 100-bed skilled nursing facility provides long-term care as well as rehabilitation care for members of all faiths. 1300 2nd Place NE 701-252-5881 www.eventide.org A skilled nursing care facility for about 115 residents and includes special units based on patient needs. 1104 25th St. SW 701-952-8750 www.edgewoodseniorliving.com This senior living community offers 60 living units featuring assisted living and memory care services. 1300 2nd Place NE 701-252-5881 www.eventide.org Eventide Jamestown provides skilled care, assisted living services with on-site therapy. Restaurant style meal service to meet the residentâ&#x20AC;&#x2122;s needs. Spiritual care is provided by a part-time Chaplain. 421 18th St NE 701-252-6404 A not-for-profit community that provides supportive services in a homelike setting, while maintaining as much independence as possible. Features 58 one and twobedroom apartments. 1315 4th St. NE 701-252-9292 www.rockofagescare.com This facility provides about 50 beds of basic care for individuals not requiring the level of assistance provided at skilled nursing facilities. 1505 3rd St. SE 701-251-1741 A secured facility that provides basic care for individuals with Alzheimer’s disease or dementia. K l ei n’ s C ol l i si on C enter I nc . 701-252-5688 www.bison6cinema.com Bison 6 Cinema is a multiplex with six theaters. It is located in the Buffalo Mall. 121 3rd St. NW 701-252-3120 1-800-657-8067 www.jamestownsun.com The Jamestown Sun serves Jamestown and the surrounding communities, providing daily newspaper service Monday through Saturday. It also publishes weekly The Sun Country, an agriculture supplement. The Jamestown Sun is the third-oldest newspaper in North Dakota. The All Vets Club, home to American Legion, AMVETS, DAV, VVA, VFW, and their auxiliaries. T H E U N I V E R S I T Y O F JA M E S T O W N ! 5 junior varsity teams, an ACHA Division I Hockey Team, an e-Sports team and a competitive Trap Shooting Club. Slightly over 50% of our full-time student body participates in at least one sport, and many are multisport athletes. For those non-athletes, the University boasts a wide array of other activities from which to choose, including: concert band, concert and chapel choir, musical theatre, dramatic theatre, and over 40 student organizations. Our students are welcomed each fall by the residents of Jamestown at the annual “Block Party” and look forward to becoming participating community members through service and employment while they are a part of the Jamestown community. We are proud of our student’s and staff’s contributions to the community, and encourage the entire campus to be supportive community members. I hope you enjoy your time in Jamestown and invite you to stop up and see us! E D U C A T IO N L ak es and P r ai r i es C h i l d C ar e A war e 920 10th St. SE Suite B 701-252-0350 Child Care Aware offers consultation, training and resources for finding child care and for early childhood professionals. Tim Eissinger, Chief Executive Officer 701 3rd St. NW 1-800-568-5175 www.annecarlsen.org Provides specialized programs and services for children and adults with disabilities, helping them maximize their full potential. www.wimbledonnd.com Located 30 miles northeast of Jamestown Wimbledon’s Midland Continental Depot Transportation Museum Featuring Peggy Lee Address: 401 Railway St, Wimbledon, ND Summer Hours: Daily 1:00pm-4:00pm Other times by appointment. Admission: Free Phone: 701-435-2875 or 701-320-1020 Website: www.midlandcontinentaldepot.com The Midland Continental was intended to be a north-south transcontinental line linking grain markets from Winnipeg, Manitoba to Galveston, Texas. All that was ultimately constructed was 77 miles of track between Wimbledon and Edgeley, ND. The main floor of the building showcases the railroad’s history. Peggy Lee (1920-2002) was an American jazz, and popular music singer, songwriter, and actress who lived and worked in this very depot from 1934 to 1937. In 1934, Marvin Egstrom became the depot agent and moved in with his family. The large living room upstairs in the depot is dedicated entirely to Peggy Lee’s life, career, and music. www.cooperstownnd.com Located 80 miles northeast of Jamestown Ronald Reagan Minuteman Missile Site and Oscar Zero Location: Oscar Zero Missile Alert Facility: 4 miles north of Cooperstown on Highway 45 Summer Hours: Daily 10:00am-6:00pm Labor Day through October & April 1 to Memorial Day: Mon.Thurs. and Sat: 10:00am- 6:00pm, Sun: 1:00pm-5:00pm Nov through March: By appointment Admission: Adult: $10, Child: $3, Students in supervised group: $1 each, Groups of 10 or more: $4 per person, Children 5 and under and members: Free Phone: 701-797-3691 www.history.nd.gov/historicsites/minutemanmissile/ This historic site consists of two sites telling the story of the Cold War years in North Dakota. They are the last remnants of a cluster of intercontinental ballistic missile launch based out of Grand Forks Air Force Base. The Oscar-Zero Missile Alert facility is a guided tour to the underground Launch Control Center where you can see firsthand the front lines of the United States’ strategy for nuclear deterrence. www.valleycitynd.org Located 30 miles east on I-94 Rosebud Visitors Center 250 Main St. Hours: Mon.-Fri: 8:00am-5:00pm, weekends during June-September: 9am-5pm Admission: Free Phone: 701-845-1891 www.hellovalley.com The Rosebud Superintendent’s Railcar served as living accommodations for S. R. Ainslie, Superintendent of the Northern Pacific Yellowstone Division. It remained in service until 1931, and was present for many events in the history of the Northern Pacific Railroad. In addition, the center provides displays on the history of the area including the ND Agricultural Hall of Fame. Barnes County Historical Society http://www.hellovalley.com 315 Central Ave. N. Hours: Mon.-Sat: 10:00am-4:00pm Admission: Free Phone: 701-845-0966 The Barnes County Historical Society is dedicated to telling the history of the area. On display is an HO scale train model of the Hi-Line Bridge, the shoes of Christian Paetow known as the Largest Man in Dakota Territory and the oldest registered car in North Dakota, a 1901 Oldsmobile. Medicine Wheel Park medicinewheel.vcsu.edu Location: located on Winter Show Road Hours: Always open Admission: Free Phone: 701-845-7452 This early culture replication rock structure measures 213 feet around. The Parkâ&#x20AC;&#x2122;s Medicine Wheel is a multicultural symbol celebrating the calendar discovery process by our intelligent human ancestors around the globe. www.parkrec.nd.gov/byways/sheyenne/sheyenne.html Hours: Always open Admission: Free Phone: 701-845-1891 This byway stretches 63 miles along the breathtaking Sheyenne River Valley, from Baldhill Dam to Lisbon, following ancient Native American foot paths and pioneer wagon trails. www.ellendalend.com Traveling 65 miles south of Jamestown in Highway 281 is Ellendale. The Coleman Museum 50 Main St. Ellendale Hours: Tuesday: 4:00pm-8:00pm and Friday: 1:00pm-4:00pm Admission: Free Phone: 701-349-4329 This building houses an outstanding collection of artifacts and memorabilia of the Ellendale area. www.cgtn-nd.com Located 45 minutes north of Jamestown on Highways 281/52 CrossRoads Golf Club 393 Hwy 281 N 701-652-2601 Reserve online: www.crossroadsgolf.com This 18-hole golf course is a challenging, medium-length layout. It features 6,847 yards of golf from the longest tees for a par of 72 . The course rating is 72.6 and it has a slope rating of 121. Ostlieâ&#x20AC;&#x2122;s Sunnyside Acres 6560 6th St SE Carrington Hours: by appointment Admission: Free Phone: 701-285-3344 www.ostlieacres.com This small family farm raises berries, garlic, and hops, along with some vegetables. Lindsay and Mike manage the land using soil health and sustainability, and pollinator habitat growing practices. Dakota Sun Gardens and Winery 955 73rd Ave. NE Carrington Hours: by appointment Phone: 701-674-3623 www.dakotasungardenswinery.com Visit Dakota Sun Gardens and Winery and enjoy the beautiful gardens and taste the award winning wines. Located a short drive outside of Carrington, itâ&#x20AC;&#x2122;s a lovely place to gather. Gun & Reel Sports has been in business for 66 years. C o mplete line o f spo rting go o ds f o r H unting, F ish ing and R ec reatio nal. If you’re looking for business-friendly hotels in Central North Dakota, look no further. Travelers looking for a more leisurely pace will find both indoor and outdoor attractions located only minutes from the hotel. These attractions include the World’s Largest Buffalo, the National Buffalo Museum and a rare albino buffalo settled in the historic Frontier Village. If you are an outdoor enthusiast, explore 30 miles of biking/hiking trails or the Jamestown Reservoir. myplacehotels.com • Toll Free (855) 200-5685 • Each franchise is independently owned and operated.